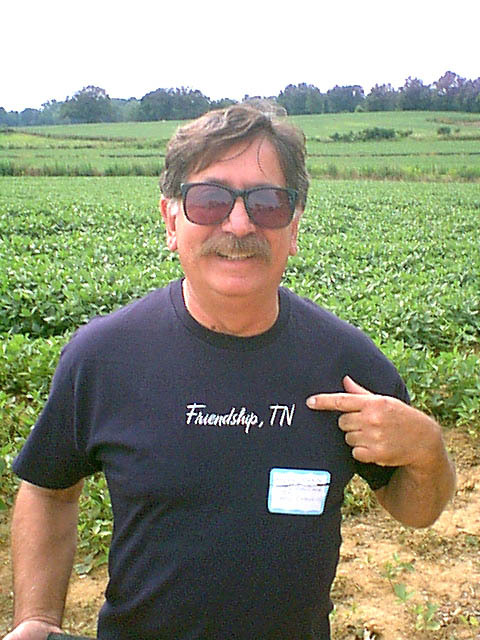 The tenth in the series of Taylor Triangle reunions was held in Dyersburg, Tennessee on Saturday, June 26, 2004. Several regulars had to miss due to special circumstances, but we still had a good turnout. We had representation from descendants of Robert, Isabella, Israel, and Ann. A group of Isabella's descendants came from North Carolina, Texas, and California to see the area of their ancestors, particularly the town of Friendship, which we included in the tour this time. Ginny and I arrived on Thursday and chilled a little after having had a rough week getting ready for the travel and the reunion and dealing with work. Sam Taylor arrived on Friday morning and we went out together to do a run through of the tour, so I wouldn't make any wrong turns during the actual tour. This time we rented an extra room to serve a meeting place at the motel on Friday and Saturday evenings. It was not used as much as the room we had in Lake City last year, but we still enjoyed it and it was worthwhile. Other cousins arrived that afternoon and we visited in the room that evening. Saturday was a busy day, particularly for me. As it turns out, I had a class reunion in Dyersburg on the same day. At 9:30, I went to the Activity Center where the reunion was to be held, unloaded the car, setup Sam and Ginny to start the reunion and left to go to the brunch my class was having. At noon, I got a call from Ginny saying that people at the reunion were wanting to start lunch, so I left the brunch early to get to the reunion in time to make the lunchtime announcements. About 3:00 we went on the tour, returning to the motel about 5:30. I cleaned up and dressed quickly to go to a 6:30 reception for my class reunion, leaving Sam in charge of the room. I came back from the reception about 9:00 and visited in the room. 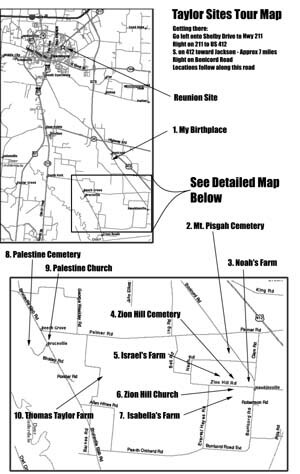 On Sunday a group went to Zion Hill Baptist Church in Hawkinsville in order to visit a church of our ancestor. Ginny and I then rushed driving the 350 miles to home and then packed that evening for a flight to Charleston the next morning on a business trip. It was a great reunion and worthwhile, but I think another like that would kill me.